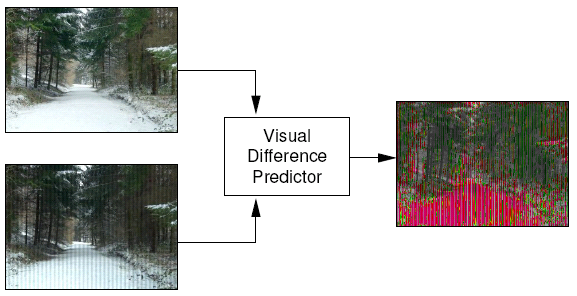 Visual difference metrics can predict whether differences between two images are visible to the human observer or not. Such metrics are used for testing either visibility of information (whether we can see important visual information) or visibility of noise (to make sure we do not see any distortions in images, e.g. due to lossy compression). The image below shows how two input images, a reference image (upper left) and a distorted image (lower left), are processed with the VDP to produce a probability of detection map (right). Such probability of detection map tells how likely we will notice a difference between two images for each part of an image. Red color denotes high probability, green - low probability. Red color is mostly present in the areas where there is a snow covered path. Because of smooth texture of the snow, there is not much visual masking and distortions are easily visible. Although there are dozens of visible difference metrics that serve a similar purpose, our Visual Difference Predictor for HDR images (HDR-VDP) has two unique advantages: firstly, our metric works with a full range of luminance values that can be meet in a real word (HDR images), and secondly, we offer a complete source code for free (under the GPL license). High Dynamic Range Visible Difference Predictor (HDR-VDP) can work within the complete range of luminance the human eye can see. An input to our metric is a high dynamic range (HDR) image, or an ordinary 8-bits-per-color image, converted to the actual luminance values. The proposed metric takes into account the aspects of high contrast vision, like scattering of the light in the optics (OTF), nonlinear response to light for the full range of luminance, and local adaptation. The HDR-VDP is a near-threshold metric, therefore it cannot be used on heavily distorted images to measure the magnitude of the distortion. The current version of the HDR-VDP does not measure color differences and operates only on luminance. 2 Jul 2008 Added errata for the HVEI paper, updated links to the manual pages. 24 May 2006 HDR VDP is now available as a SourceForge project. vdpcmp - low level function. Most of the options is documented there. vdpvis - prepare visualization of VDP's results. Please check also the frequantly asked questions and the README file in the .tar distribution. The HDR VDP sources can be downloaded from the SourceForge project page. A complete source code is licensed under the GPL. pfstools and FFTW packages must be installed before compiling HDR VDP. HDR VDP have been tested on several distributions of Linux and cygwin, but it should compile on any UNIX-like platform. This is a list of alternatives to HDR VDP. The list does not include quality metrics since they measure slighly different aspect of image difference. JNDmetrix - commercial metric from Sarnoff. Discontinued as a software package. If you aware of other fidelity metrics based on models of the visual system, please send me link to its web page. or to ask the author directly.